It takes a lot of artists and creative talent to develop the Marvel animation art that we all love. The amount of effort that goes into each episode of Ultimate Spider-Man or Wolverine & The X-Men is astronomical so we thought we'd break down the process a bit and give you all a glimpse behind the scenes (so to speak). We found a great scene of Storm from the 2009 animated series "Wolverine & The X-Men" to get us started. Marvel's animated cartoons run at a speed of 24 frames per second (fps). The motion is "shot" on the two meaning that one drawing is shown for every two frames of film... or roughly 1440 animated drawings PER MINUTE of animated action. There is some variation to this as faster movements require less frames, while more fluid movements require more frames. For the average Marvel animated TV series, there can be between 30,000 - 50,000 of hand-drawing work to create 22 minutes of a tv show. How do they do it? Well it begins with a script and a storyboard... these original images from Wolverine and The X-Men storyboard artist Al Bigley showcase how the script is pulled into a sequence of drawings with direction and dialogue. Once the script and storyboard are finalized we get into the animation process itself... breaking apart each scene into animation folders that setup the pieces. First, a Scene Setup is created (like the one shows here of Storm). Usually drawn by the art director, this scene setup is a complete image to show the animations a rough idea of the end result. This scene setup gives the master animator an idea of all the elements needed for production. These drawings are usually a bit rough, but colorful to showcase the end animation goal. 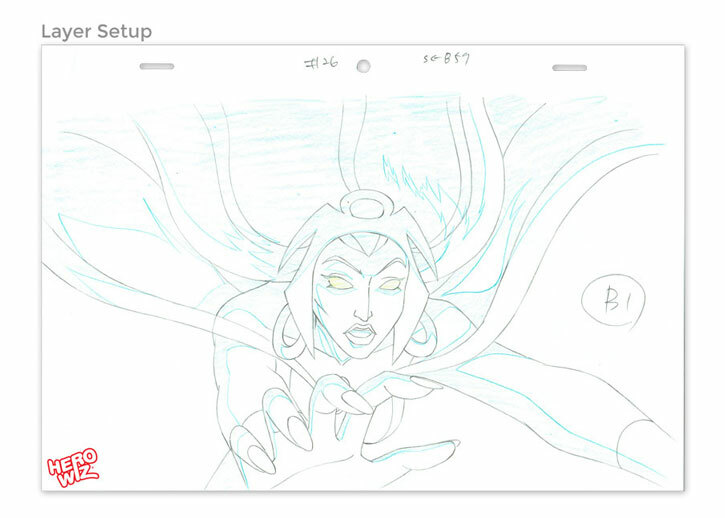 Next, the Master Animator re-draws the scene as a layer setup, separating out each of the elements in a scene that contain motion onto individual pieces of art. Third, Keyframes are drawn by the master animator. These are tha main images of a scene (usually the first, middle and last image of a particular scene). You can tell these keyframes in the final art by a symbol that looks like the letter F with extra lines through it. This symbol showcases if the motion is shot "on twos." What do we mean by "on twos"? One drawing is shown every two frames of film (running at 24 fps), meaning there are only 12 drawings per second. Faster movements require less frames and those are usually animated “on ones”, as “twos” are too slow to convey the motion adequately. Mixing the two techniques keeps the visual movement feeling smooth but more fluid movements require more frames so “on threes” so on may be used. Diagram A shows the keyframe mark and layer position. Diagram B shows that this belongs to Layer C, Drawing 5. Next, Tweens are developed. Tweens (also called inbetweens) are done by the studio artists and apprentices. 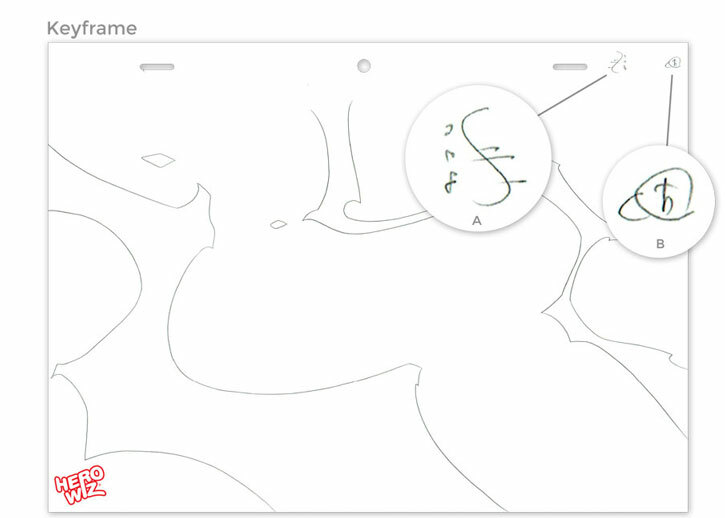 These drawings are the frames that sit in between the keyframes to create motion on screen. For every motion eye motion, mouth movement, hand movement, etc. within an animated series there are layers of tween pages to create that motion. In the tweens shown below you can see the motion of Storm's hair while the red lines indicate her body position. A sheet or multiple sheets of clear acetate or nitrate which is hand-painted and then placed over a background and photographed. The outline of the character (hand-painted or xeroxed) is applied to the front of the cel. The colors are hand-painted onto the back of the cel to create an even tone of color. A production cel set-up created and sold by the Courvoisier Galleries in the late 1930s/early 1940s. Characters are most often trimmed to image, glued to the background, covered with a protective top cel. In the case of a multi-cel set-up, cels are always from the same film, but may not all correspond to the same moment in time. A number of distinctive backgrounds were used. Wood veneer, polka dots, stars, and hand-painted watercolour backgrounds. The original set-ups were framed in an off-white mat and penciled name of the character written, and a "WDP" stamp. Labels were attached to the back. Often, the cels from Dumbo and Bambi were laminated. Two or more production cel levels. On our site, set-ups are simply called production cel regardless of the numbers of levels. We do call out within each animation listing how many layers are included. 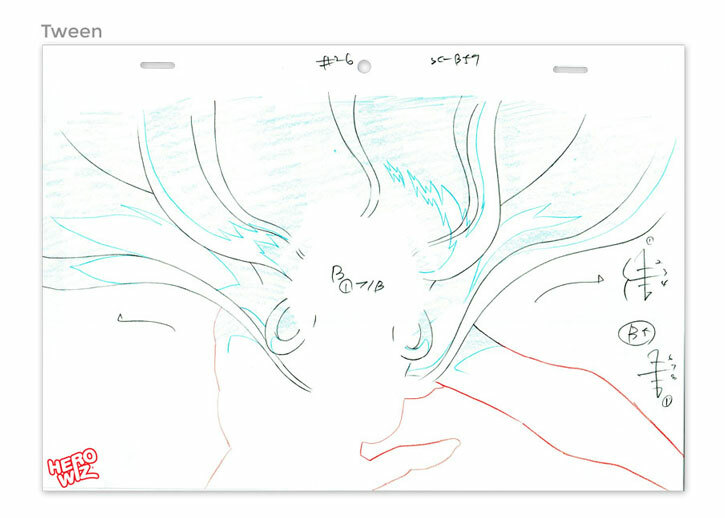 The individual cels for a cel set-up do not necessarily appear at the same time when traced in the show. Sometimes, the cels are placed together in a set-up to maximize the aesthetic effect of the piece. Cel set-ups are without a production background and usually come with a reproduction or custom background. If the set-up includes a production background, it is termed a master set-up or a key master set-up. A cel created by the Ink and Paint department for accurate colour-referencing during production. Color test cels have colors different than the final characters. Production cels sold at Disneyland from the mid-1950s to the early 1970s. Cels in these set-ups are trimmed and against either a litho background or against solid color background. It is common for cels in these set-ups to be adhered to the background. Disneyland cel set-ups in their original matting have a gold seal attached to the back of the mat. Occasionally you will find Disneyland cel set-ups that have a cel from one film and a background from another. For example it is common to see a Jungle Book cel on a litho of a Sleeping Beauty background. These are also referred to as Disneyland Art Corner cels. Mostly sold in the 1970s. Full cels laminated and embossed with "Original hand-painted movie film cel". These seals are larger than the ones used today. Many Robin Hood and Rescuers cels fall into this category. Occasionally, a Sleeping Beauty cel will have been sold in this manner. A cel from the opening or closing sequence of the show or feature where the list of names comes up or the title of the show. Refers to an original, one-of-a-kind production drawings created by an animator from which the cels are later created. In the digital age of animation, now these cels are scanned directly from the original drawing. These are becoming much more rare and are showing a huge increase in value due to the art being drawn directly on a computer or tablet. HeroWiz specializes in this type of animation art. Production drawing done by an animator to indicate the position and pose of the character. Later, a clean-up drawing is created by referring to, or drawing directly over, the rough. The cels are then created by tracing or xeroxing over these drawings. Production drawing done by referring to the rough drawing. 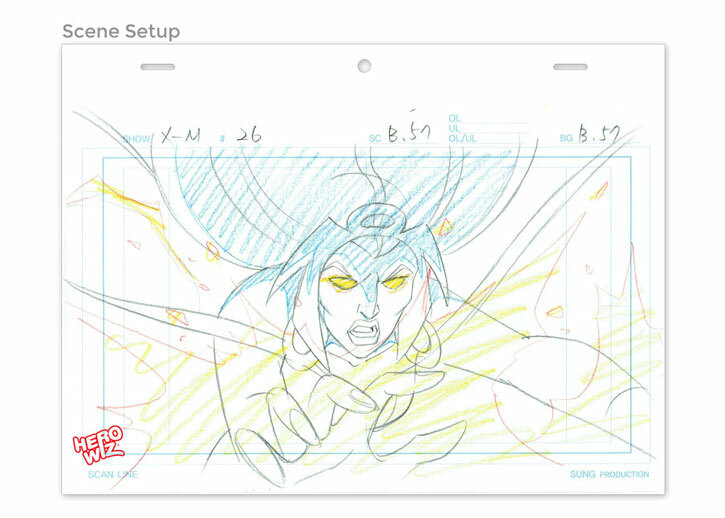 From these drawings, the cels are then created. Production drawing done by the head or lead animator. The "key" is a small chart on the side that indicates the beginning and ending of the movement as well as an indicator as to the speed in the timeline. Production drawing which is coloured in various sections with notes pertaining to the paint colours to be used by the ink and paint department. These are pretty rare. Very detailed production drawings depicting master backgrounds, or showing camera movements with sketchy indications of the placement of the characters. The original drawings that were used to create photostats. They are original pencil drawings of a character usually shown in several different positions or from various angles. Photostats were used in the process of making probably every cartoon. Photostats were made by the animators in the studio at the time of the film. The term photostat refers to the copying process which was used back then. In our experience, they are most often acquired from the estate of an animator. Photostats were made from original model sheet drawings showing the characters in many poses. Sometimes animators made their own model sheets. The photostats would be produced and given to the various departments to insure consistency among all of the animators working on a project. Hundreds of photostats would be made from the original which usually had various drawings trimmed and mounted on a board. They most often have pin holes at the top of the pieces as the animators would pin the drawings above their desks to refer to so that all of the drawings are uniform in their look. An original drawing hand-done by the character's creator for someone, most commonly a request from a fan. They are usually signed and sometimes dedicated. These were not used in the production of a cartoon or strip, but are still extremely collectible. Many of the artists who appear at comic-cons offer these for a reasonable cost. Giclees (j'clays) are the latest in reproduction animation art. According to Linda Jones Enterprises (distributer of Chuck Jones' art), the giclee is "a french word which means 'spray of ink'. Because no screens are used, the prints have a higher apparent resolution than lithographs...more than four million droplets per second...the prints are lush and velvety with the feel and luminosity of a watercolour." Gicless are printed on either paper or canvas. One of the reasons why they are such a unique form of printing is because they can be done on canvas and as a result can closely mirror the look of an original painting. They are also sometimes hand-embellished on top of the print. A printing process created by stone or metal plates. A plate is created for each color, and the artwork must be run through each color plate to create the final image. Lithographs may also come in open editions as well as limited editions. A silkscreen printing process using paint rather than ink. A color stencil is created for each color and the paint is wiped or squeegeed through a screen onto the paper beneath. An original hand painted etching is created with a steel engraving needle scratched by the artist into a varnish-covered zinc or copper plate. In an acid bath the etch is created to the desired depth. Following the completion of the etch process the plate is cleaned and colored. The printing is then done with a hand driven printing press on wet hand made paper. After drying the etchings are lovingly hand colored with watercolors.